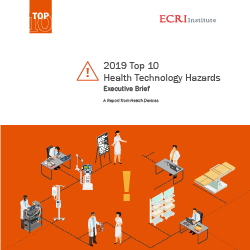 Download ECRI Institute's 2019 Top 10 Hospital health technology hazards list to stay on top of technological innovations, cybersecurity threats, and hazards that could affect cost, care delivery, and patient safety. Hackers exploiting remote access vulnerabilities, mattresses remaining contaminated after cleaning, and retained surgical sponges—these are just a few of the potential danger areas that we identify in our Top 10 Health Technology Hazards for 2019. Find out what technology hazards may be putting your patients at risk, and what you can do about it. ECRI Institute Members: Log in to access the complete Top 10 Health Technology Hazards Solutions Kit.